MO - Journal » Articles » Remplissage : When Bankart is not enough! Remplissage : When Bankart is not enough! The shoulder joint is a ball-and-socket joint. 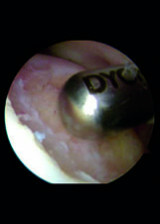 Only 25 to 30 % of the humeral head makes contact with the glenoid surface at any position. This explains that the shoulder has the greatest range of movement of all the joints in the body. In contrary the risk of instability is higher than any other congruent joint. The shoulder joint is a ball-and-socket joint. Only 25 to 30 % of the humeral head makes contact with the glenoid surface at any position. This explains that the shoulder has the greatest range of movement of all the joints in the body. In contrary the risk of instability is higher than any other congruent joint. The stability of the gleno-humeral joint relies on the joint surfaces and the muscles (concavity-compression effect), on the capsulo-labral structures and at a lower degree, on the negative intra-articular pressure . Any deficiency of these factors, especially the capsulo-labral structure and the bone structures can lead to shoulder instability.